For the past decade or so, I’ve been paying the bills as a software engineer/developer/architect (the titles change). On the sly, I play at being a philosopher, musician, and essayist. I grew up in the US, but my lovely wife Preeta and I decided to be adventurous and moved to France in 2006. 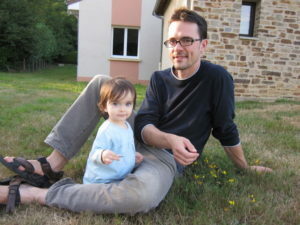 Now we live in a renovated post office in rural central France with our adopted dog, Bella, and our daughter Rumika (born in 2009). Preeta writes her novels, I work on my projects (currently Patients Know Best and eMusicTheory), and we roam the countryside. It doesn’t always make for interesting stories, but now and again I may get lucky. I just wanted to let you know that your website for Preeta is really cool and I am enjoying your blog too. What i do not realize is in fact how you are no longer really a lot more well-liked than you might be right now. You are very intelligent. You already know thus considerably in terms of this subject, produced me personally imagine it from a lot of varied angles. Its like men and women don’t seem to be fascinated except it is one thing to do with Girl gaga! Your personal stuffs nice. Always deal with it up!